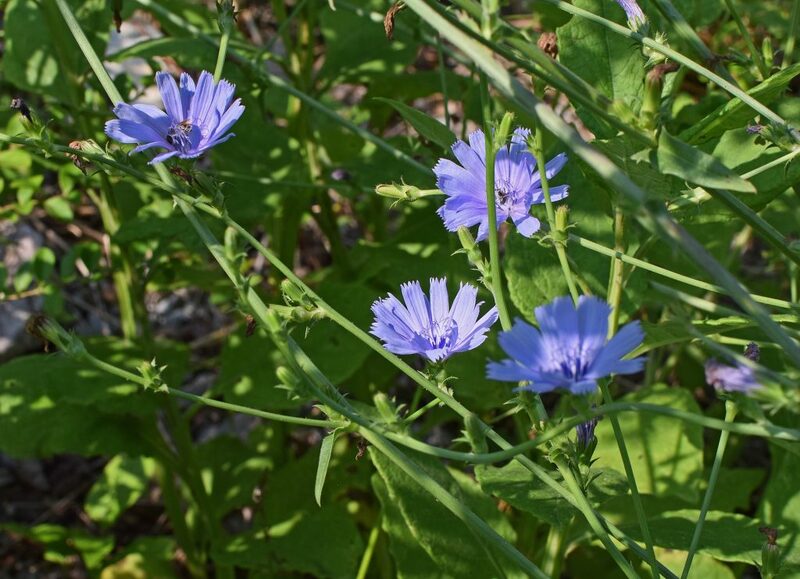 Kasani (Cichorium intybus) is a common herb also known a chicory, blue daisy, blue dandelion, blue weed, bunk, coffeeweed, horseweed or wild bachelor’s button. Kasani possesses a flower with a stem that can reach 100 cm, and the flower heads are roughly 4 cm in diameter. It is found growing wild across Europe, North America, China and Australia. It is thought the plant is native to Europe and but has been introduced to other areas by humans. It is a perennial herbaceous plant of the asteraceae (dandelion) family. Kasani has bright blue, white or pink flowers. The plant has a number of culinary uses including use of its leaves in salads and its bud and roots which can be use for the production of a hot drink, often touted as a coffee substitute. The leaves have a bitter taste rather like dandelion leaves. Kasani has a number of medicinal uses including known antiparasitic effects. Other uses include a number of beneficial effects on the gastrointestinal tract including hepatoprotective effects. 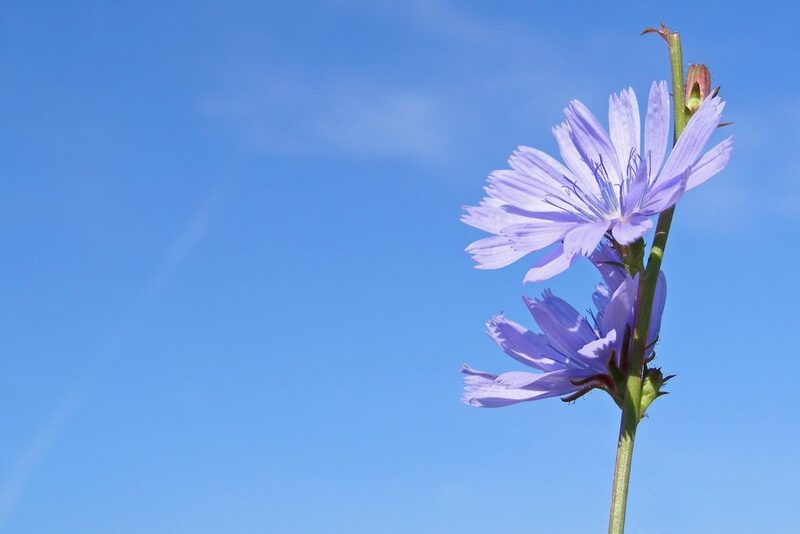 Kasani is the Ayurvedic name for chicory. The claimed Ayurvedic properties attributed to kisani include; a relaxant to induce sleep, anti-inflammatory effects, a liver stimulant, an appetite stimulant, a blood purifier, a diuretic, a blood pressure modulatory, an eye tonic, a natural laxative, a modulating effect on menstrual disturbances and a modulating effect on body temperature. Image from : By Original book source: Prof. Dr. Otto Wilhelm Thomé Flora von Deutschland, Österreich und der Schweiz 1885, Gera, Germany (www.biolib.de) [Public domain], via Wikimedia Commons. The liver protective effects of kasani have been investigated mostly using animal models. Extracts of kasani have been shown to exhibit significant hepatoprotective effects in rats models where carbon tetrachloride was used to induce liver damage. The addition of kasani significantly depressed the elevated levels of aspartate aminotransferase (AST), alanine aminotransferase (ALT), alkaline phosphatase (ALP) and total bilirubin (TB) that are markers of liver damage. Studies have also shown that doses of kasani of between 50 and 100 mg per kg body weight were protective of liver carbon tetrachloride induced damage in rats, but higher concentrations (200 mg per kg) were less effective. Therefore they may be an optimal dose of kasani that is beneficial, above which detrimental effects occur. One possibility is that at higher doses, the metabolism and excretion of the herb itself starts to impede liver function, undoing the beneficial effect it may have at lower doses. 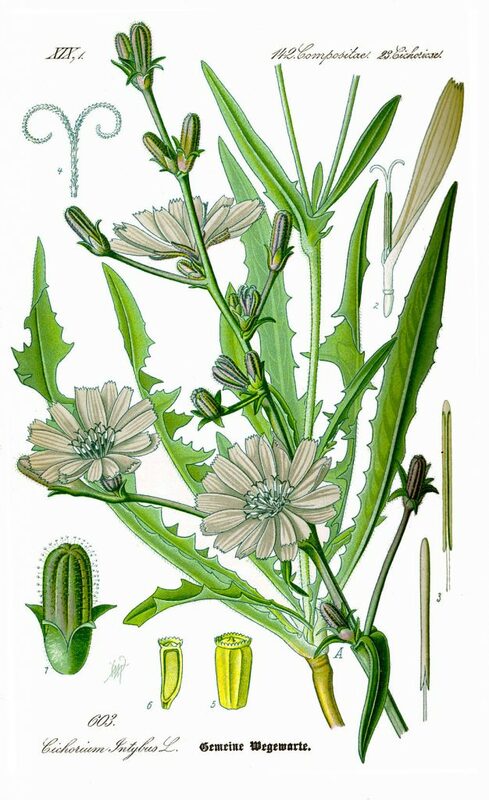 Kasani (Cichorium intybus) contains a guaianolide sesquiterpene glycoside called cichotyboside, that may be responsible for its hepatoprotective effects. Cichotyboside exhibits significant protective effects against experimentally induced liver damage in rats. Cichotybodside was significantly more effective compared to another hepatoprotective herb silymarin in regard to some aspects of liver protection. Some human studies have been performed to investigate the hepatoprotective effects of kasani. For example, in one study, the effects of an extract of kasani with another herb, Cinnamomum zeylanicum (cinnamon), were investigated in human subjects with non-alcoholic fatty liver disease. Ther herbs were given as a decoction. The patients receiving the kasani and cinnamon extract experienced a significant reduction in the liver enzymes alanine aminotransferase (ALT), aspartate aminotransferase (AST) and alkaline phosphatase (ALP), which often become elevated during periods of liver stress. In addition, the herbal extract also significantly reduced blood levels of fasting blood glucose, cholesterol, triglycerides, high-density lipoprotein (HDL) and low-density lipoprotein (LDL). A herbal mixture of kasani with Cinnamomum zeylanicum therefore appears to provide hepatoprotective effects to human subject with non-alcoholic fatty liver disease, and may have beneficial effects on blood lipids. The seeds of kasani (Cichorium intybus) have also been investigated for their hepatoprotective effects. In comparisons with the hepatoprotective herbal compound silymarin, kasani showed equivalent hepatoprotective effects. Rats exposed to the hepatotoxin carbon tetrachloride exhibited no fatty accumulation in the liver, nor any necrosis of the liver when coadministered kasani. Chemical analysis of the leaves of kasani show that it contains a number of different phytochemical groups that play an important role in health. The flavonoid (6.82 mg per gram) and phenolic acid content of the leaves is particularly high. Also present are tannins (0.59 mg per gram) and saponins (0.18 mg per gram). The minerals zinc, magnesium, calcium, sodium, manganese, selenium and copper have also been found in the leaves. The mineral composition of the plant will likely vary depending on the soil and growing conditions. Studies show that the leaves of kasani have a significant antioxidant capacity, and might be expected from the presence of the flavonoid, tannin and phenolic acid compounds in the leaves. The presence of selenium, zinc and manganese in the leaves also suggests that consumption of the leaves may improve the activity of glutathione peroxidase and superoxide dismutase, two antioxidant enzymes that rely on the presence of these minerals. Kasani has a woody stem and distinctive blue flowers, although these can sometimes be white or pink. 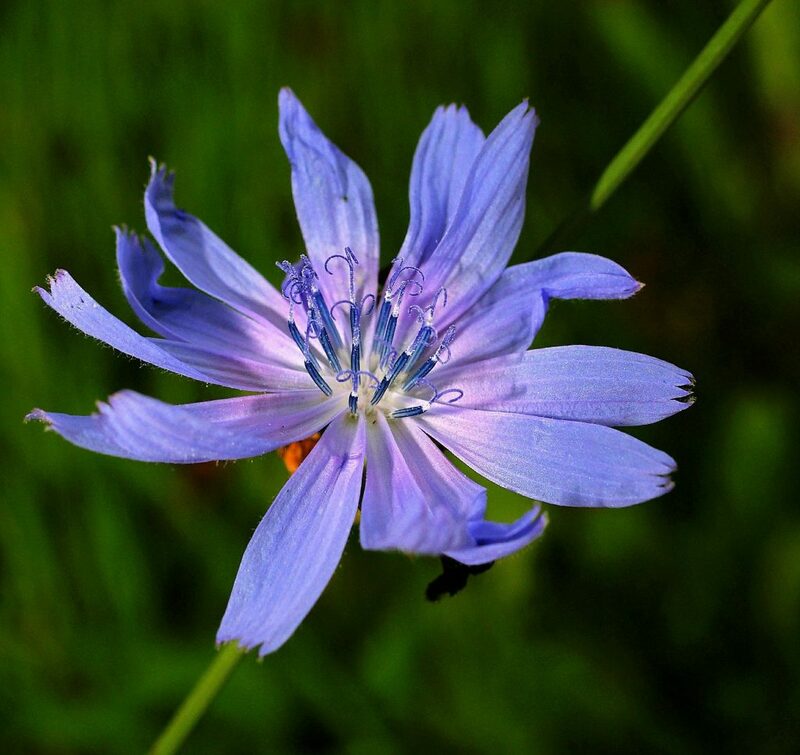 This entry was posted in Kasani / Chicory (Cichorium intybus), Liver. Bookmark the permalink.